It was a little alarming to realize that anyone from the current wave of kids' musicians had yet released enough music to compile a greatest-hits album. (Yet another sign I'm getting old, I guess.) But sure enough, Daddy a Go Go (a.k.a. John Boydston), one of the pioneers of tunes for children that sound good to their parents, too, has put out seven CDs in the last 10 years. 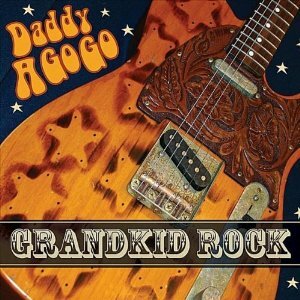 And so for his latest, Grandkid Rock, Boydston decided to take a look back, remixing, remastering, and reissuing 16 favorites from his previous output. Like most "best of" compilations, the result is an ideal way for the uninitiated to get a taste of what the artist is all about. In the case of Daddy a Go Go, that's good old classic rock-'n-roll with a decidedly southern bent, reminiscent of everyone from George Thorogood and Neil Young to early R.E.M and (I'm about to date myself once more) the Georgia Satellites, with tinges of '90s alternative bands like Cracker and Belly thrown in for good measure. What put Boydston on the map originally—and has kept him there ever since—is that his guitar rock really, well, rocks; he was among the first to recognize that kids don't need this music to be watered down in the slightest. (I submit as evidence my own two-year-old, who immediately began grooving to the opening chords of the first track, "I Wanna Be an Action Figure.") It doesn't hurt that the musicianship and the skills throughout are (ahem) rock-solid, either. The lyrics are the typical kid-topical, though Boydston keeps his tongue firmly in cheek throughout (e.g., song titles like "For Those About to Walk, We Salute You"). But whether he's keeping the kids happy by singing about finishing vegetables or embarking on a rockin' cover of "What a Wonderful World," parents will be thrilled to find that they're doing a little head-nodding to these songs, too. Children at the serious chapter-book level who are already looking to have their expectations shaken up a bit will be delighted by just about any of the dozens of books the man has written, right up to last year's Adventures of a Cat-Whiskered Girl. (Parents who never encountered Pinkwater’s fertile, chaotic mind as kids themselves will be in for a treat, too.) But Lizard Music is kind of where it all began (at least for me). It's told from the point of view of Victor, a 14-year-old boy left behind by his parents when they go on vacation under the supervision of his slightly older sister. (Can you tell yet that this book was written more than 30 years ago?) He is, of course, delighted when his sister ditches her responsibility and leaves him entirely alone. While he’s staying up late and watching as much TV as he can, Victor stumbles upon a late-night transmission from a group of, well, alien lizards. With the help of a local character known as the Chicken Man (who’s based on a real Chicagoan), he decides to try to find out what the lizards are up to. Obviously, this is not your average kids' chapter-book plot synopsis (though thanks to Pinkwater's influence on a generation of writers, it's slightly less out there than it was when the book came out). Stated flatly, it may even sound a bit off-putting, but the tone of the writing—wry, sardonic, humorous, never taking itself too seriously—is all. (I think my friends who were the biggest Pinkwater fans as kids went on to become Frank Zappa aficionados in their later teen years—there's a common thread there. )This author's work is about reveling in being different, and while today we have a whole genre of entertainment on that subject, his approach still remains fresh, and all his own. So if you see Captain Beefheart albums in your child's future, I can pretty much guarantee that this new edition of Lizard Music, complete with the author's own original woodcut illustrations, will become an immediate favorite. 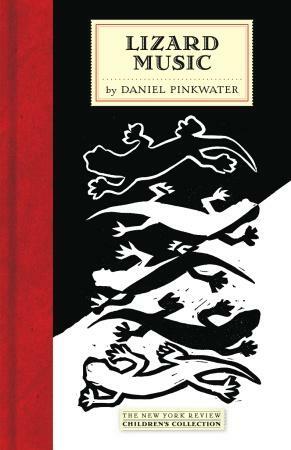 And even if you don’t, it’s well worth a look—Pinkwater has been a cornerstone of children’s lit for quite some time now, and this is one of his best. But sometimes enthusiasm overwhelms logic. 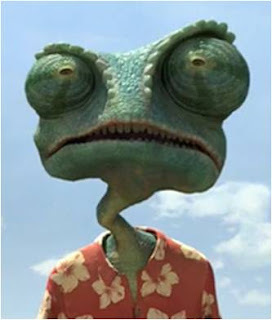 Such is the case for me with Rango, a wonderfully odd new animated film directed by Gore Verbinski, of Pirates of the Caribbean fame, and featuring the voice of that series' star, Johnny Depp, in the lead role. With the best of the non-Pixar division of animation, you tend to hear a lot about how beautiful the film is. ("Good-looking" is in this genre the equivalent of "having a good personality," I guess.) Rango is no exception: Revered cinematographer Roger Deakins has a consulting credit on the movie, and while I have only a very vague concept of what that means, exactly, for an animated film, the western vistas against which this story plays out are often breathtaking, and several lighting effects will have you wondering if the filmmakers have surreptitiously switched to live action. But as remarkable as its visuals are, they’re not what makes Rango truly special—to my mind, the first Hollywood animated film that competes on the same playing field with Pixar. This is a strange movie, in the best sense: one that doesn't follow the by-now-worn paths most modern animated kids' films obediently trudge along. Among its delights is that, at least until it reins things in a bit for its denouement, you're never be quite sure where it's heading next. Depp's title character is a pet chameleon, and the film opens in his imagination. (Indeed, there's always the possibility that we're spending the whole film there, a device I admit I'm always a sucker for.) He is happily play-directing a "film" starring himself and various inanimate objects in his tank, when an unforeseen accident leaves him alone on a desolate western highway. After being briefed on the concept of mystical missions by a Don Quixote–esque armadillo, he wanders through the desert to the town of Dirt, where various locals (each a different personified, and very realistic-looking, animal—somehow the mole looks both like a real mole and like Harry Dean Stanton, who provides its voice) are struggling to survive due to a dwindling water supply. In the tradition of many a comic western, from My Little Chickadee to Three Amigos!, our hero is mistaken for a gunslinger and immediately appointed sheriff, then tasked with solving the water problem. He soon finds that it has something to do with the town's mayor, a smooth-talking turtle (voiced by Ned Beatty, who's been cornering the market on animated villains lately) who seems to be the only one in town with a regular water supply anymore. Rango is written with Pixar-ian cleverness, its adult-aimed references aimed coming a mile a minute, yet delivered subtly and smoothly enough that kids won't be distracted by them. Many of the subtlest are just cinematic: Between them, Verbinski and composer Hans Zimmer give a nod to just about every famous film ever set in the West, from John Ford's oeuvre to Sergio Leone's spaghetti westerns (their hero gets a cameo as “the Spirit of the West,” voiced by Timothy Olyphant) to Raising Arizona (whose yodeling theme gets an homage during a chase sequence). The other voice talent maintains the high level set by Depp, though that's no surprise—the one thing you can count on in even the worst animated films nowadays is a crack voice cast. This one includes Isla Fisher as Rango's traditionally dubious love interest, Alfred Molina as the questing armadillo, and Bill Nighy as a truly scary rattlesnake gunman with a pencil mustache. 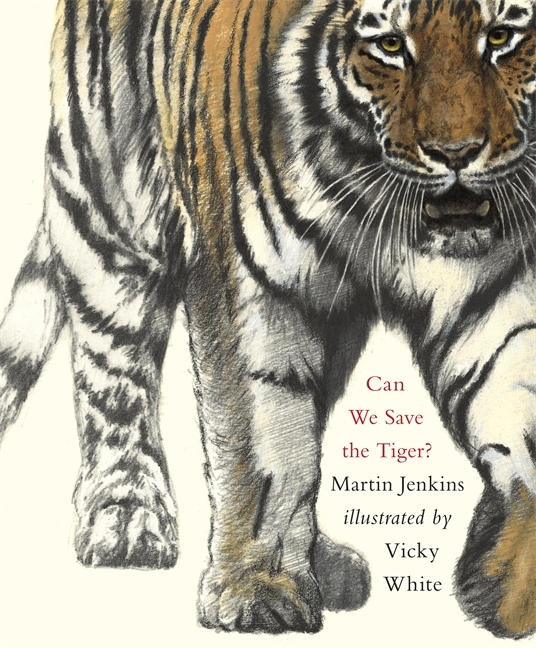 New Books: Can We Save the Tiger? But reading on these subjects for the younger set doesn't have to be limited to the classic allegories of The Lorax; there are a happy few standouts in the genre as well, such as Raymond Bial’s A Handful of Dirt and Dan Yaccarino’s The Fantastic Undersea Life of Jacques Cousteau. Joining their ranks is a new picture book from author Martin Jenkins and artist Vicky White, Can We Save the Tiger? Jenkins avoids the high-handed tone of many books on animal extinction, and instead calmly and reasonably puts forward the facts for kids to examine for themselves. First, he defines the term extinction itself, with references to some of the more famous vanished creatures—the dodo, the auk, the marsupial wolf—each rendered, as is every animal here, in White's stunning, meticulously detailed pencil and oil illustrations. Then Jenkins introduces many of today’s endangered species, leading with the always appealing tiger. (He clearly knows his audience.) In each case, he briefly runs through the situation that has put the animal in such dire circumstances—the fierceness and beauty of the tiger, as well as its need for wide spaces in the face of ever-encroaching human expansion; the introduction of a previously unknown predator to the habitat of the partula snail; and so on. 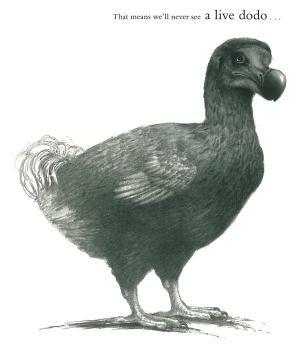 Perhaps best of all, Jenkins is surprisingly nonjudgmental, writing with understanding about the reasons why people have made decisions that have been so devastating to these animals. Which leads him to his key point: Because the endangerment of so many of these creatures is almost intrinsic to their very state of existence in the modern world, it will take a concerted effort from humanity to save them. Then, to drive home that such efforts are not lost causes, he turns to a success story—the comeback of the American bison—to show it can be done. 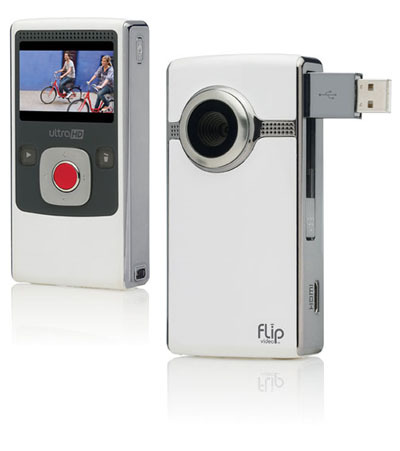 I am, I know, way behind the curve in my appreciation of Flip cameras, which I first remember hearing colleagues at Cookie rave about three or so years ago. I believed them, but it never seemed like the most important gap in our technology world to fill; after all, we had a perfectly functional video camera already. Then last year, Grandpa, having learned of our six-year-old's fascination not only with movies in general but with how they're made (he's started watching the "making of" extras on every DVD intently), decided to buy Dash his own Flip Ultra for Christmas. We complemented the generous gift with the popular kids’ Movie Maker kit, and Dash was off and running. Now, I don't want to exaggerate his dedication or focus here—Dash is still six, and we move forward with the project only in fits and starts; we shot our first scenes only last weekend. But he keeps asking to return to it weekend after weekend, which has kind of amazed me. What amazes me even more, when I stop to think about it, is that a six-year-old and his not particularly tech-savvy parents actually can shoot and edit their own Dickens adaptation in our own home. My own six-year-old self is very jealous. The only problem, really, is that we always want to use the Flip for ourselves instead of our own video camera (which recently, and conveniently, died anyway). While this hasn’t yet led to any conflict, I'm thinking that we ought to get our own soon…. 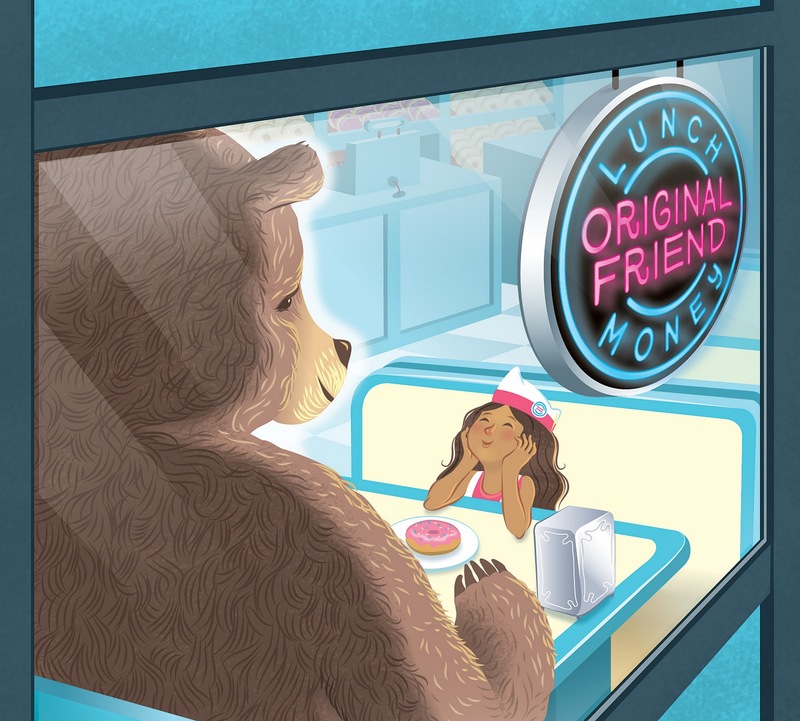 Recently, I came across the first book I've seen since that bears the clear influence of Cabret, from author Carolyn Coman and illustrator Rob Shepperson. 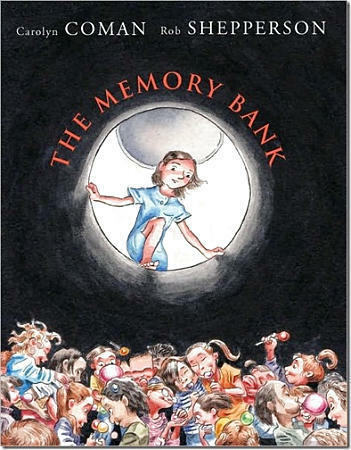 Which is interesting, because otherwise, The Memory Bank is reminiscent of children's books of a prior generation, making it a perfect fusion of 20th- and 21st-century styles. Like the authors whose style The Memory Bank harks back to, Coman and Shepperson manage the remarkable feat of endowing a seemingly grim setup with airiness. (Both the Dahl-ian setting in a not-quite-real world and the Juster-ian allegories help.) And Shepperson uses Selznick's illo-storytelling technique to particularly good effect; his passages reveal their plot details obliquely, much like the dreams that some of them represent do. The result is one of those books that grade-school kids who are ready for books with some depth will love; parents reading along with them will find themselves unexpectedly affected. The Memory Bank is both a gem in its own right and, I hope, a sign that Selznick's push beyond the traditional boundaries of children’s storytelling is now a trend. Back when I included Lunch Money's latest album in my best-of-2010 list, I promised to give it a writeup of its own—only fair, since all the other albums included got one. And I always keep my promises...eventually. On this, their third album, the band has expanded beyond its guitar-bass-drums core with some nifty string and horn arrangements on slower tracks like “Getaway Car” and the R.E.M.-ish ballad “Follow Me Home.” But it’s their trademark upbeat indie-pop songs—the title track and especially the grin-inducing “I Want to Push Buttons”—that form the backbone of the album. The guest artists slide in nicely, too, with England, a similar songwriter and vocalist, fitting in seamlessly on "You and Me and a Bottle of Bubbles," and 23 Skidoo typically sharp with his rhymes in the clever "Come Over to My Dollhouse." It all adds up to one of the best albums I've heard not just in the past year, but in my five years of covering kids' music. So really, it’s about time it got its own post! 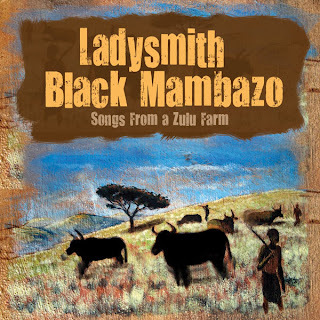 I thought about trying to become the only U.S. reviewer not to mention Paul Simon in a piece on Ladysmith Black Mambazo’s new album, but it’s just impossible, isn’t it? (Look, I blew it already.) Nearly any American parent’s first contact with the South African a cappella musicians was the now-classic Graceland album, though the half-century-old group long ago made it clear they were a force to be reckoned with long before Simon brought them to an international audience and Grammy recognition. They remain so, as evidenced by their latest release, Songs from a Zulu Farm. It’s not exactly a children’s album, at least in the sense of one aimed only at kids; I suppose you could call it more a “family album.” It’s essentially a look back by Ladysmith’s leader, the astonishingly energetic 70-year-old Joseph Shabalala, and some of its other older members at their childhoods, through “the songs from the earliest time in our lives,” as Shabalala puts it. Most of the songs are traditional, and reference either the animal life of the Zulu countryside (for instance, “Ntulube,” which aims to chase river snakes away so the singers can swim) or parental exhortations (“Imithi Gobakahle,” which calls kids indoors as skies darken before a storm), but there is a new song here as well: Shabalala’s own lovely “Thalaza,” a wistful look back by its writer at the innocence of childhood. By the way, Ladysmith Black Mambazo is currently in the midst of a U.S. tour to support the new album, and will be up and down the East Coast over the next month or so. For dates and venues, check out the group's website. I find that picture books generally have you at hello or they don't. For the most part, you can tell at a glance when you have a standout on your hands, whether it's the transcendent art or the clever concept. Since authors have to get that appeal across to young kids' barely-there attention spans, it's usually right out front, impossible to miss. But there are exceptions, the books whose brilliance parents may not fully realize until they see them in action with their children. 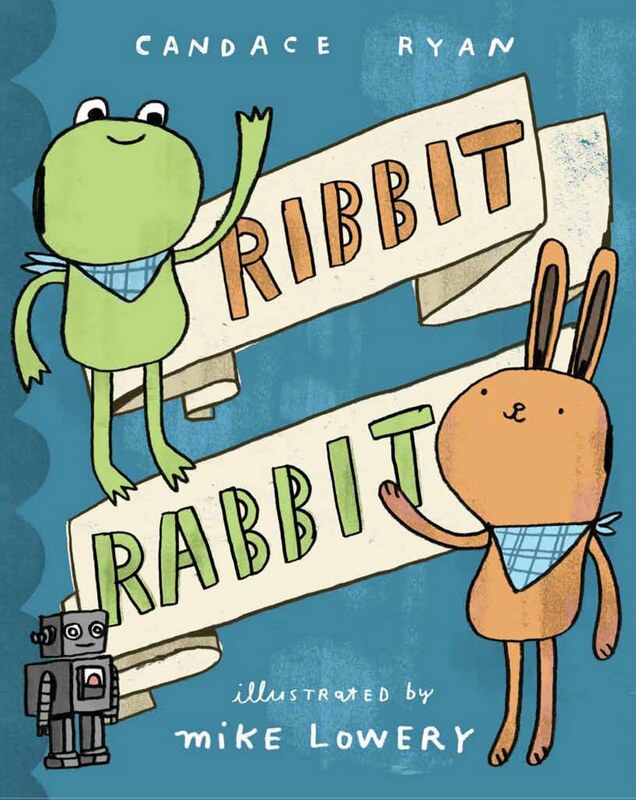 Such a book is Ribbit Rabbit, which at first glance looks like nothing more than a modestly charming addition to the "sharing is good" subgenre. It's about a frog and a rabbit (naturally), two best friends who do everything together. Understandably, now and then they have some disagreements over sharing toys and such, but in the end they value the friendship too much not to make up and solve the problems. 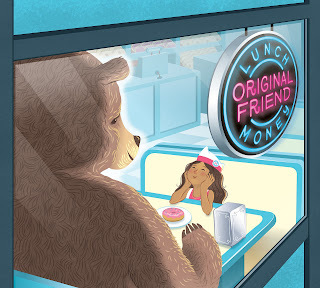 And that's it, really: a sweet little tale, accompanied by Mike Lowery's ebullient, childlike-in-a-good-way illustrations. But it wasn't until I read the book with our two-year-old that I saw what author Candace Ryan is really up to. She punctuates each sentence of her simple story with a linguistic twist on the title: "Dip it, dab it" when the friends are playing together in a pool, "nip it, nab it" when they start their fight over a treasured toy robot, and so on. And while that may seem merely cute to an adult, turns out it's right in the wheelhouse of kids in the process of picking up language. 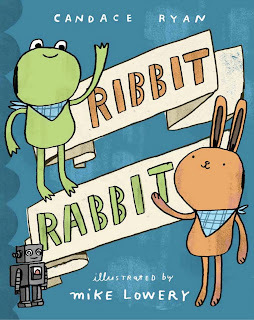 The rhyming wordplay of Ribbit Rabbit delights Griffin as no other picture book of this kind has; he took to it immediately and intensely, and it continues to make him laugh many multiple reads later. In fact, it's among the first books he's ever sought out to read by himself—and what higher praise is there than that? It's a new month, so I can put up one more housekeeping post: Momfilter, a new parenting/lifestyle website from the founding editors of Cookie magazine, is live! As I mentioned a little while back, I'll be cross-posting there and here on kids' entertainment each and every Friday (starting this coming Friday! ); I'll also be contributing to the site on subjects outside of kids' entertainment. But since anyone reading this likely has read their fill of me already, the real draw is, well, everything else: Brilliant ideas and solutions and thoughts from some of the savviest, smartest parents I know on nearly every subject known to parenting. As Pilar and Yolanda put it, the idea is "just the right balance of inspiration and information"—which happens to be not only the perfect aspiration for a parenting website, but also a subtle (and I'm gonna say intentional) reference to a great Shuggie Otis tune. Check Momfilter out!